Remember how I'm trying to decorate a mini-kitchen within my own kitchen? I posted about it first here. 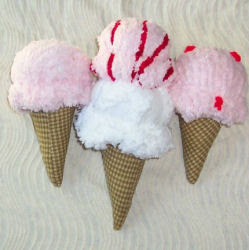 Wouldn't these plush ice cream cones be absolutely delightful? I really like the idea they offer on their site to use these as party favors. Can someone please do a ice cream party with these and the W.S. ice cream cone cupcake molds. sad news about the WS ice cream cupcake molds - they're kind of top heavy and tip over really easily! i need to figure out a way to make them stand up more firmly.